Q: The Beatle Paul McCartney’s first name was not actually Paul. What was it? Answer to last week’s question: The word ‘robot’ means ‘forced labour’ in Czech. The winner was the GREAT Eddie Arthur. A school bag with a difference! Yes, at the top (above the Olympian bear) is the Beninese president, Yayi Boni (or Boni Yayi, to be more correct). Yes, a president on a school bag – that’s a new concept, eh? I cannot imagine kids back in the UK going to school with Tony Blair or Gordon Brown on their school bags, and I don’t suppose the US have ‘Bush bags’ either. Still, when you think about it, it makes perfect sense. Yayi Boni has brought in numerous changes since he came to power two years ago, including educational reform. This includes education at elementary level being free. Here’s an article about Yayi Boni and here’s his blog. Also, don’t forget to click on the RHS of this blog under ‘Benin’s economic growth’ for a fab article. * Lois has just had a ‘girls weekend away’ at Casa del Papa, near Ouidah. * The rest of us went to the Peace Corps auction on Saturday, and got some good bargains. * We had a record-breaking power cut the other day – 28 hours without power!!! Thank goodness for generators. * School starts back on Wednesday. * We have a house and a car lined up for our return to the UK and fly back in July. By the way, how well do you know Benin? Have you taken my Benin Quiz yet? It’s only 10 questions, but is fun to do. Click here to test your Benin knowledge. Q: The word ‘robot’ means ‘forced labour’ or ‘drudgery’ in which European language? Answer to last week’s question: The Nile has tributaries called ‘blue’ and ‘white’. The winner was Paul Morriss. …if you wanna be a Bible translator! The two songs used were: (i) ‘Jaab’ based on 2 Timothy 3:16 and (ii) ‘Konbenn’ based on Romans 15:4. I made the 12 hour or so journey up to Dapaong – the northernmost town in Togo – for the occasion (on public transport/car sharing this time, to give the Land Rover a rest). A tiring trip, but worth every minute. Great to catch up with so many friends and colleagues too, but it was all over so quickly! Around 2000 people were at the ceremony and the weather was dry and slightly cloudy – so not too warm. 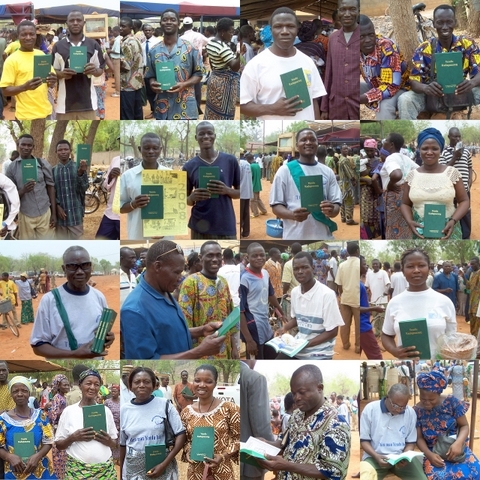 It was a great occasion and LOTS of New Testaments were sold at the end. This is the first time the Moba people have had the NT in their own language. Jan, Sylvia and the team have spent the last twelve years doing the translation, as well as many years preparation prior to that. Here’s what a section of a Moba NT looks like – see if you can spot Pentecost, Jesus, Galilee, Jerusalem and Mesopotamia. Oh, and Yendu means God, by the way. There are also some pretty colour pictures in the Bibles, but I can’t show you everything in one post! 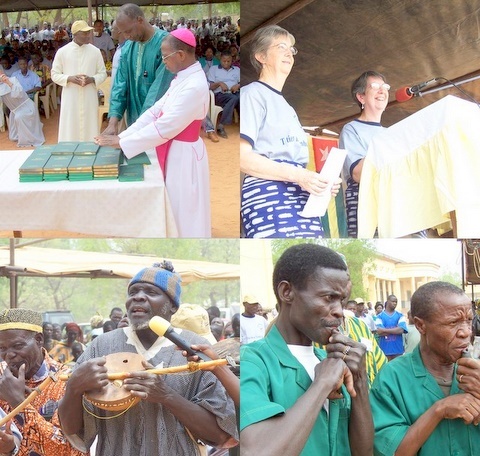 Instead, here are some more pics from the dedication – TL: Praying over the New Testaments, TR: Jan and Sylvia (translators) giving a speech, BL: A griot singing and playing the traditional guitar and BR: A couple of traditional 3-holed flute players. That’s all for now. Thanks for reading and Happy Easter! Q: Which African river has two tributaries called ‘blue’ and ‘white’ respectively? 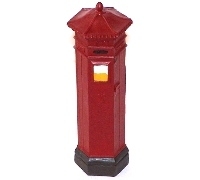 Answer to last week’s question: The first ever pillar box was designed and introduced by the author Anthony Trollope. There was no winner. I’m not sure it would pass health & safety standards back home. You’d only have to catch your leg, right ear or left hand with the racket to get a nasty shock. Still there is a warning on the racket not to touch this part, and it is only activated when you are pressing a little button. That said, I certainly keep it out of my kids’ reach! (i) The aerosol spray – kills ’em alright, but probably kills you slowly too! Nightmare if you suffer from asthma, I can tell you. (iii) The hand clap – fun but tricky. Success rate 20%, but rewarding when it works. The more adept can even try the single handed squash using the fingers of the same hand against the palm. Once I was in a church clapping along to some syncopated rhythm (as you do) and – by chance – an unfortunate mozzie flew between my hands at the precise moment they clapped together. And I wasn’t even trying to squash it! – they may repel mosquitoes, but the quantity of carcinogens emitted could seriously damage your health. This report (as well as this one) suggests that burning one all night could equate to having over 100 people smoking in your bedroom!! PS Here’s another blogger’s take on the racket (just in case I’ve not given you enough links yet). PPS ‘Orca Deco’ is a great shop for lots of household stuff. Well worth a visit if you’re in Cotonou. Here’s where to find it on Google Earth/GPS: 6Âº22’31.40″N 2Âº25’22.60″E. Come on folks – there must be more where those came from (but this time your brain, not mine!) Think up a clever one and leave it in ‘comments’. A special prize goes to anyone who can fit The Central African Republic in without anyone noticing! Q: The first pillar box was introduced in England in 1853. Which famous author of the time is believed to have introduced it? Recognize anyone? Did you laugh?!? Well, a local Christian musician, Mathieu Assogba, has been working with me a lot on my research here. So, when he came to filming his latest pop video he asked me to come along and play the cÉ›nkumÉ›n, a large gourd used in traditional music here. So, they sat me down in someone’s back yard, where there was a large blue sheet draped across a wall, and I played along to the CD. When I’d finished playing, he said “You speak a bit of FÉ”n, can you mouth the words to it”, so, with difficulty I did! A couple of weeks later and this is the result. Incidentally, I also put him in touch with the white dancers too, who had a whale of a time learning the moves. Check what Lauren says about the experience here and here. Oh, and apparently it’s been on local TV already – scary! That almost qualifies me for Celebrity Big Brother!!! That’s all for now. Bon weekend!